Because we packed so much into one trip, we only barely made it to the Garden of the Morning Calm before closing time. The man at the ticket booth informed us that we had about 30 minutes before we needed to be out of the park. Since we had driven all that way we went ahead and got our tickets and proceeded to rush through the grounds. 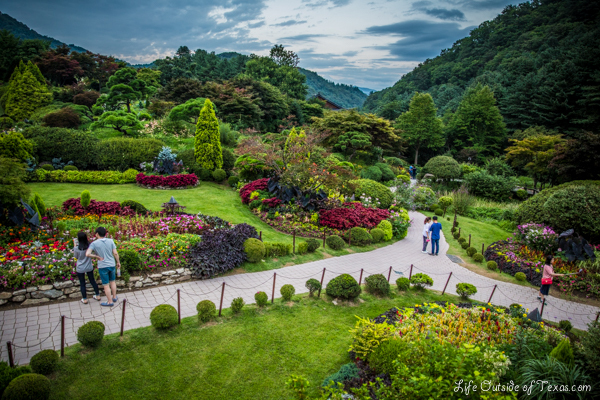 I had first read about the Garden in an article by CNN Travel that named it one of the 50 most beautiful places in Korea. I base a lot of our travels off of the same article and have found myself disappointed by many of them. It’s not that I don’t think Korea is beautiful, but it seems like the article was based off of 50 beautiful photos and doesn’t necessarily represent the places I would consider Korea’s most beautiful spots. Based on that and some mixed reviews on the Garden of the Morning Calm, I wasn’t sure what to expect, but I wanted to find out for myself. I am so glad we made the trek there because I absolutely fell in love with the place! It’s nestled up in the mountains and the setting is majestic. The entire area is surrounded by mountains and pine trees and carpeted with lush, green grass and flowers of every color. 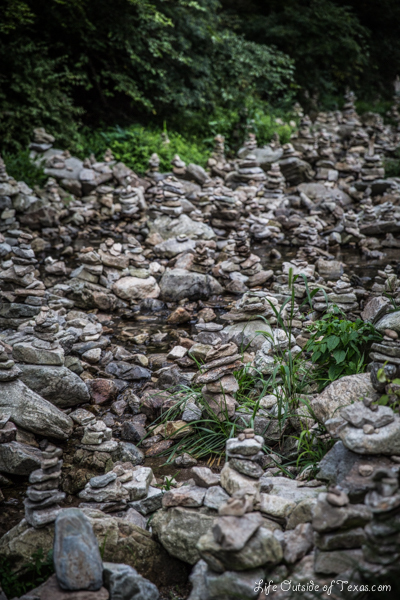 There’s also a small creek running through the park with hundreds of piles of stacked rocks. And a beautiful Korean garden with a pond and a pavilion. 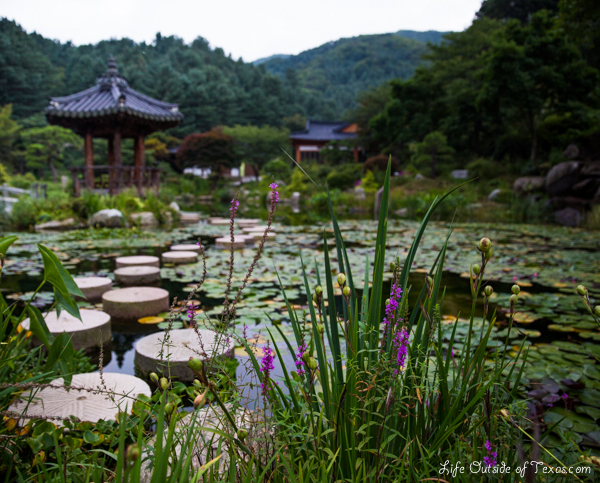 To say that the Garden of the Morning Calm is the most beautiful place I’ve seen in Korea is a bold statement, but it’s one I’ll stand behind. It’s so different from your usual cultural heritage destination in Korea. I can’t speak for what it looks like during the rest of the year, but it’s certainly a great place to visit in summer and I can’t wait to check it out in all four seasons! The Garden of the Morning Calm is open year round from 8:30am until sunset. The park is quite large (30,000㎡) so give yourself at least 1.5 – 2 hours to walk around (30 minutes does not do it justice!). The flowers bloom from March to November and they hold many different festivals during this time: Spring Garden Festival (spring), Festival of Roses, Hydrangea and Roses of Sharon (summer), and Festival of Chrysanthemums and Autumnal Tints (autumn). The park is also open until 9pm in winter for a Lighting Festival. 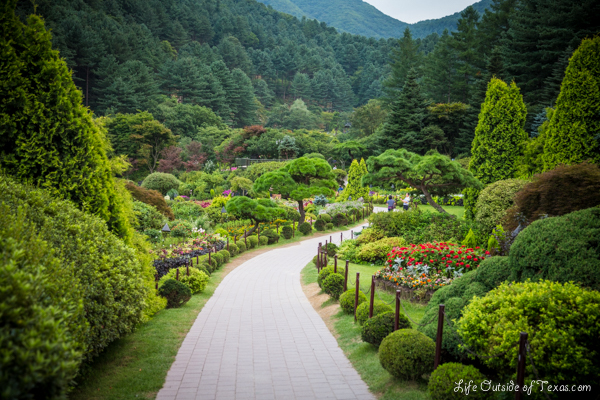 This entry was posted in 50 Beautiful Places to Visit in Korea, Autumn, Gyeonggi-do, Korea by Season, Places to See in Korea, Spring, Summer, Uncategorized, Winter and tagged garden of the morning calm, gyeonggi-do korea, korean garden, korean gardens, places to go in korea, seoul things to do, seoul tourist attractions, south korea tourism, things to do in seoul, things to see in seoul by Meagan & Dave | HappilyEverExpat.com. Bookmark the permalink. 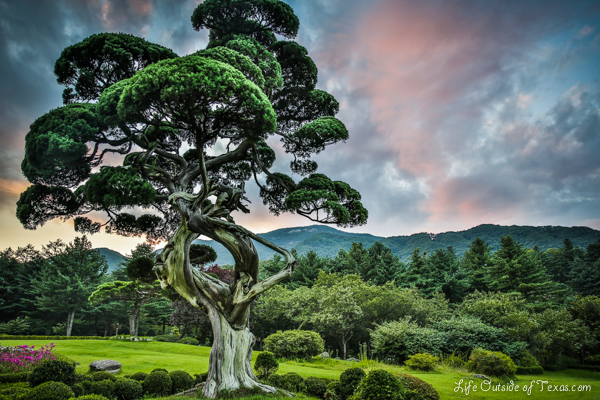 I love the name “Garden of the Morning Calm.” Beautiful photos! Thanks, Mary! It’s a lovely place and the name is very fitting. Places like this make you realize why Korea is the Land of the Morning Calm. I’m looking forward to seeing your pictures when you make it back there. I’m sure it’s absolutely gorgeous in the fall as well. Thanks! We don’t take many HDR shots, but I really love the effect it had here. I’ll definitely be posting more photos next time we go. Wow, this place sounds absolutely awesome! I wish I could go, but school (ugh) is starting up in a couple of days. It looks beautiful! I think I’ll need to look into going for the autumn festival! Thanks for sharing. I can’t even imagine how beautiful it will be in fall! We are going to try to get back in fall too. Wow, it looks gorgeous!! I think I may put this on our list for Fall, as I’ve heard Gapyeong is a great place to be during that time as well. I was thinking you should do a post about the places you’ve been less than thrilled with from that CNN list. I think it’d be really interesting and helpful, since most people don’t know where else to look for advice on where to go. Hearing from someone that doesn’t work for a big company about their honest opinion of those places would be valuable. I think we may go back in fall as well. I’m not sure what the best time for fall colors is in that area. We have Oct 24-26 tentatively planned. I haven’t been to Seoraksan so I thought we’d throw that in that trip too. Great idea about that post! I am going to start working through all of the places we have been on that list and write some posts. I’m so behind on editing photos and posting blogs it’s unreal. Thanks! It’s been one of my favorite places in Korea so far. So beautiful! Yes, it was terribly frustrating. We power walked so we could see as much as possible, but there was still so much we didn’t see. Your pictures are stunning. What a beautiful place! I think it would be perfect to bring along a book, find a nice spot and just soak up the beauty along with some good literature. I have another thing to add to my list places to see in Korea. I was thinking it’d be a perfect place for a picnic. The grass wasn’t roped off (that I noticed), but I didn’t see anyone really on it either so I’m not sure what the rules are about that. Gorgeous photos! I wish I had heard about it before the hydrangea festival! You’re so lucky you have a car haha. Looking forward to more pictures of what it’ll look like in other seasons! Life in Korea is definitely much different with a car. When Dave and I first started dating it was so weird to see Busan from above ground! You should definitely check out the garden sometime. I think you’d really enjoy it. I love all things that have to do with nature. So, this place seems absolutely perfect for a day trip. Thanks for sharing the information on location and times as well. I’ll be back for that info. If you love nature this place is definitely right up your alley! We can’t wait to get back again! Did you visit the Morning Calm Garden again in autumn? Looking forward to the fall color. Yes, we actually visited this past weekend. It was really pretty, but very busy! The Garden is really gorgeous! I had the honour to work at the Garden of Morning Calm as their first non-korean intern! It was quite a cool time their! I miss the Gardeners of Morning Calm! I’ve been meaning to take a trip to see the Garden of the Morning Calm, so when your site popped up in my Google Search, I had to take a look! Wish me luck as I will be venturing there via public transport! Omg! It’s beautiful!! I’ll be visiting in a few days time and i can’t wait to see how the place is like in winter… Thanks for the review! Btw how long is the journey to this place? Hi Nura, not sure where you’re coming from. We drove so I probably don’t have the information you’re looking for. BoboandChiChi.com has a great post about the gardens on their blog that you should check out as well. The gardens are amazing and I think you’ll really enjoy your time there! So, is it better to visit on morning? I always love visiting places in Korea as soon as they open. They tend to be less crowded. But definitely give yourself some time to walk around.